The International Anti-Corruption Academy (IACA) became an international organization in March 2011. It represents a joint initiative by the United Nations Office on Drugs and Crime (UNODC), the Republic of Austria, the European Anti-Fraud Office (OLAF) and other stakeholders. Its aim is to overcome current shortcomings in knowledge and practice in the field of anti-corruption. Members of IACA include all UN Member States and international organizations, which have signed, ratified or acceded to the IACA Agreement. 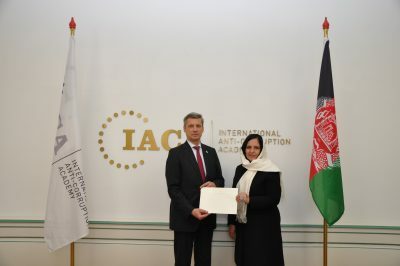 The PM of Afghanistan engages with IACA in research on structural reforms and attends tailor- made trainings, all of which represent opportunities for knowledge transfer and networking.